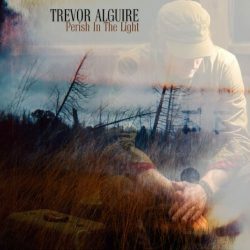 Canadian singer-songwriter Trevor Alguire has in Perish The Light his sixth album, and with a wealth of travelling behind him back home and across Europe, he is a seasoned performer. No sooner does the needle drop onto the vinyl and Alguire establishes a groove as he shares stories of his worldly travels, speaks of love and of having to stand strong. “My Sweet Rosetta” produces an eerie piece of music for fellow Canadian, award winner Catherine MacLellan to perform a duet. Gritty, dark and foreboding through fine use of fiddle, Miranda Mulholland (Great Lake Swimmers, Belle Star) a moody and captivating canvas is painted. In “Flash Flood” with its twangy electric lead guitar, incessant rhythm and more superb bright and sparkling fiddle, the hugely talented players ensure Alguire has the place hopping. His music is boundary defying as he pulls on haunting heartfelt balladry, some cool professionalism and raw energy of he likes of Jason & The Scorchers without planting roots, making either one his home. Instead, he cultivates the best nuances from them all, places them in a big melting pot to come up with his own sound. On occasions, admittedly he does become more band-like than I would ideally like to hear but his boundary pushing capabilities aren’t met by many; or ability to write and deliver a killer ballad in the form of “Out Of Sight / Out Of Mind” (more like this would be just wonderful! ), wrapped in purposeful pedal steel guitar, and a good old fashioned country shuffle. It is the ace in the pack. At his best when he produces a roving, but trimmed enough not to over-indulge rhythm as in tempered “Wasting My Time”, underscored in swirling fiddle, electric lead guitar, keyboards and tight rhythm section. More measured still and serene is “If I’d Stayed School”, set to chugging beat and more inviting fiddle he signs-off on a high. Recorded in Hamilton, Ontario, Alguire calls on excellent players in Jeff Asselin, Chris Gauthier, Bob Eagan pedal steel; Wilco, Blue Rodeo), Jesse O’Brien keyboards (Colin James, Bryan Adams) and aforementioned Mulholland to add to his self-penned tunes. Americana singer-songwriter with far-reaching ability, and well able to provide a real classic band sound.